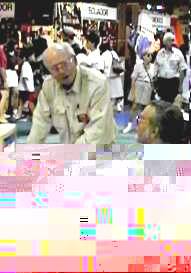 As we prepare to wind down for the 1998 summer months KWARC has just received notice of the demise of another ICON of Amateur Radio. After 60 years of prominent presence at the annual Canadian National Exhibition, the VE3CNE station has become a Silent Key. The decision by the CNE to no longer offer a distinct Arts, Hobbies, and Crafts area as once was the case. We used to part of the displays at the Arts, Crafts and Hobbies building, (A,C,& H for short) before it was leased to a commercial venture. It is most unfortunate that the CNE no long has a forum to display, in a central place, the myriad leisure activities which are out there in the community. As a consequence of the decision above, VE3CNE has led a peripatetic existence since the closing of the A, C, & H Building. The support of the CNE in finding us a home each	year has been exemplary but the lack of a fixed location did not help our focus or our visibility. Some years our location has been ideal, as was the case last year when we were in the Automotive/International Building. Other years found us in the Better Living Centre, surrounded by vendors who had no connection to our hobby. Beggars cannot be choosers but some years have been much easier than others. Moving in and out of a new location each year has put a strain on our human resources. Station antennas had to be erected and taken down, coaxial cable pulled, equipment lugged in and out. Prior to 1983 VE3CNE was organized by someone who was paid to do this by the CNE. 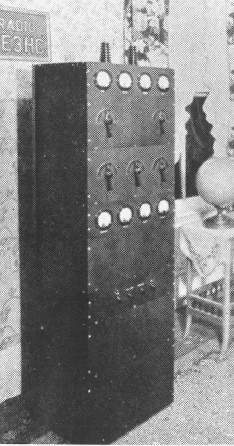 He had the luxury of a fixed location, support from the CNE to put up and take down antennas, etc. In 1983 this relationship soured so an ad hoc committee of concerned Amateurs was struck with the aim of keeping VE3CNE alive. They assumed responsibility for fund raising, obtaining equipment, etc. Despite the largesse of the CNE it costs us in excess of $1500 annually to put on VE3CNE. The VE3CNE Committee is comprised of Amateurs from various clubs in the area, meeting monthly to plan VE3CNE. We have had difficulty recently in persuading many clubs to provide a representative to sit on the committee. Consequently over the past five years the organization of VE3CNE has fallen to a few people. Many of them have simply "run out of steam". 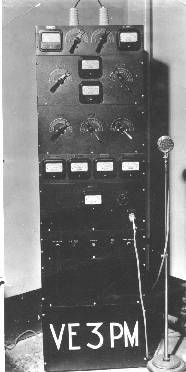 We have too many "old backs" which no longer can handle the physical demands of getting VE3CNE on the air and then taking everything apart, in concert with long hours as Duty Station Managers from 10:00 a.m. to 10:00 p.m. In 1997 nearly four hundred Amateurs from over twenty-one clubs helped to staff VE3CNE over the eighteen day run of The Ex. The clubs came from the immediate Toronto area, York Region, Mississauga, Burlington, and Hamilton. Last year we even had participation from a club in Orillia. Staffing VE3CNE is a difficult exercise. Since 1983 our strategy has been to have one club responsible for staffing VE3CNE for a whole day, from 10:00 a.m. to 10:00 p.m. Members of the organizing committee serve as station managers, many taking several shifts during the run of the CNE. Each year we approach all the clubs who have supported us in the past. This year we have clubs that have elected to no longer participate, which makes it more than possible that we cannot get the necessary staff to mount the display. The predominant reason seems to be that their members are so busy simply keeping their employers happy that they have less free time than before to devote to their hobby. This is a challenge being faced by all groups that depend on volunteers. The VE3CNE Committee has decided that if we cannot do it well then we should not do it at all. The inset photos depict the First and Last stations to operate from the Canadian National Exhibition. The top photo of the 75 Metre VE3PM station and the 20 Metre VE3HC station are courtesy of Fred VE3HC. these two stations were part of the very first exhibit at the CNE in 1934 when the call VE9CNE was used. The next two photos are reprints from last September's Kilowatter. 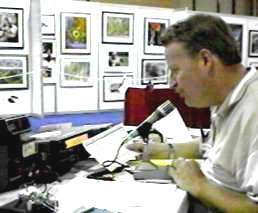 the middle photo is VE3SJF operating the Ontario Phone Net from the VE3CNE station and the bottom photo shows Llloyd VE3BZF discussing Packet Radio. 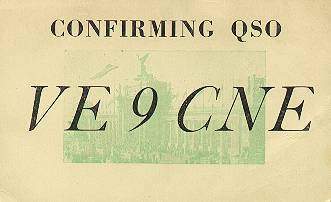 I have e-mailed copies of these photos along with a copy of the first VE9CNE QSL card (below)from 1934 to Geoff should the VE3CNE committee choose to document the 60 year history.